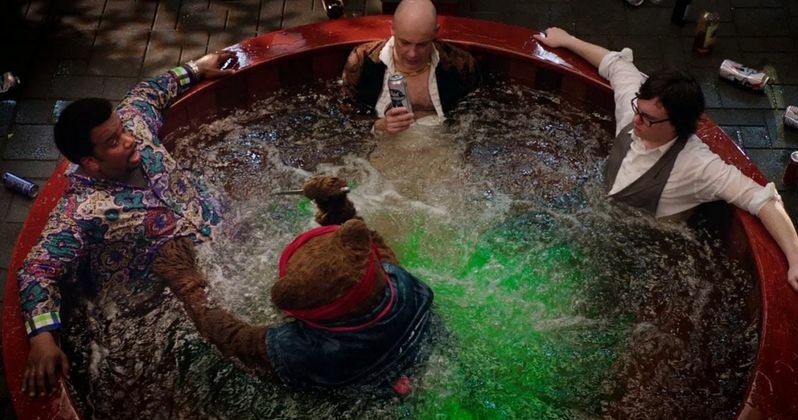 Hot Tub Time Machine 2 just debuted its Red Band trailer, the first trailer of any kind actually, at Comic-Con 2014, bringing a first look at this comedy sequel which finds Adam Scott joining Craig Robinson, Rob Corddry and Clark Duke for another trip down memory lane, literally. Check out the debut footage before its release in theaters this Christmas. Also starring Chevy Chase and Gillian Jacobs. Set 10 years after the original, Rob Corddry's character Lou is now a billionaire, after using the time machine to change Google to Lougle. The story centers on Nick (Craig Robinson) and Jacob (Clark Duke) who use the time machine to try and get back to the past after Lou gets in trouble, but they inadvertently end up in the future, which they must alter if they want to save their present-day environment.